While still somewhat of a twitter noob there is something that I really like about it. Social networking can be a bit hit and miss these days but for me twitter is just a better way of doing things. I enjoy being able to connect not only with friends but chefs, restaurateurs and complete randoms, but it is the chefs who usually get all the attention. We had only been to The Carrington a month or so ago but a few innocent tweets became what was our latest booking for Pintxos Tuesday! This time around we had Mr O and Em joining us and this time around it was ALL about the pintxos. Now some of us were quite excited about it, I would like to quote something Mr O may or may not have said during the day, “I might need my own bill tonight because I am going to smash a thousand pintxos into my face and not apologise for it.” Enough said. As usual we were early for our booking so we spent some quality time in the bar, drinking beer and wine, and charging phones with the uber cool Phone Charging Vending Machine they have hiding in the corner. After a bit of a chat and a few tweets later it was time to head over to the restaurant side. Lex promised head chef Jamie that she would say hi this time and as we walked by the kitchen Jamie spotted us and had a bit of a chat. Again thanks to Jamie as per our last visit we were to be seated at the ‘VIP’ table in the corner above the bar. Sadly for Em she was stuck at work so our first round was going to have to be without her. The plan was to order 1 each of the pintxos specials each… 1 each of them each… Our waitress advised that it could be a little too much food to start so instead it was to be 2 of each of them… to share… sort of. Nothing was to stand in the way of Mr O and his chance to ‘smash a thousand pintxos’ so there was a platter for him and one for Lex and I. 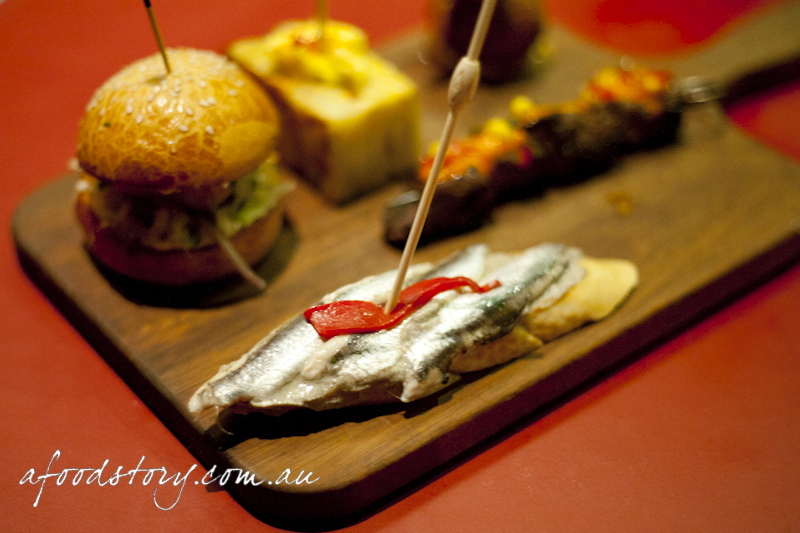 The $3 pintxos for the night were: Pork belly slider with witlof slaw, Smoked cheddar & chilli tortilla, Deep fried paella balls with chorizo and octopus, Bbq beef skewers with mojo picon, White anchovy & smoked eggplant tostada. White anchovy & smoked eggplant tostada ($3.00). First cab off the rank was the white anchovy tostada, a slice of toasted bread stick with a generous smear of eggplant puree that was lightly smoked and seasoned giving it a lovely warm texture. The anchovy fillets were so wonderful and firm with a great pickled acidic feel that was a perfect contrast to the smoked eggplant and chewy tostada. Bbq beef skewers with mojo picon ($3.00). The BBQ skewers were quite easy to share so they were second to be sampled. Smeared with the kitchen’s own mojo picon consisting of the tasty red sauce, chunks of red capsicum, sweet corn kernels, slivers of onion and threads of coriander; the beef had a great firm texture like a real BBQ skewer should and quite a superb grilled flavour that permeated the beef. Deep fried paella balls with chorizo and octopus ($3.00). My only concern last time I had the paella balls (other than the squid ink) was that the rice could have been cooked a little better (it was Jamie’s first service with a new Pintxos crew). Issues aside we were ordering these again no matter what. Boy oh boy was I glad we tried them again. They were epically good, the rice was so perfect, stupendously creamy and with the skilful balance of salty squid ink and smoky chorizo I found these to be a million times better than last time! Smoked cheddar & chilli tortilla ($3.00). Since we had decided the slider was to be last it was the tortilla up next. With a skilful slice I was able to cut the tortilla perfectly in half yet keep all of the aioli on my portion. Just as per our last visit the potato was sliced so thin and cooked so well it just melted away with the layers of smoked cheddar. 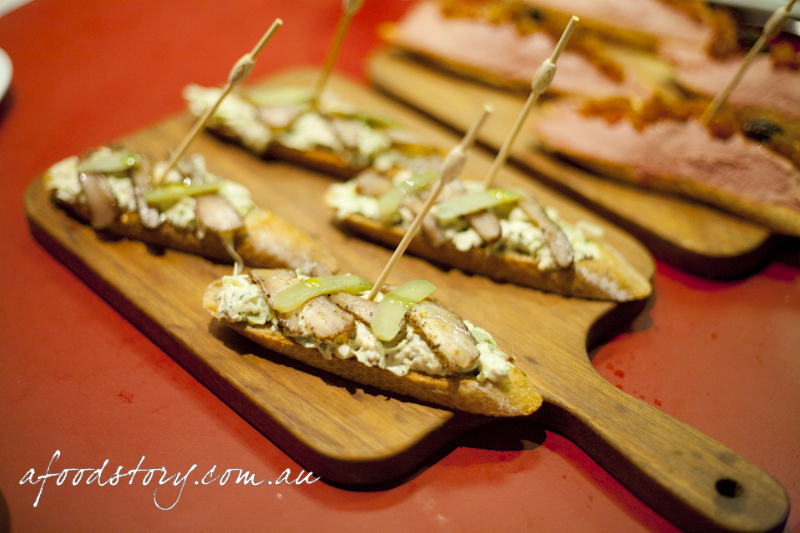 Flashes of chilli and a creamy aioli rounded off the pintxo nicely. Pork belly slider with witlof slaw ($3.00). The slider looked impressive from the word go, and it did take quite a lot of self control for me to do the right thing and share it with Lex. I wish I was able to take Mr O’s stance and smash this thing but as we were sharing it seemed a little unfair. 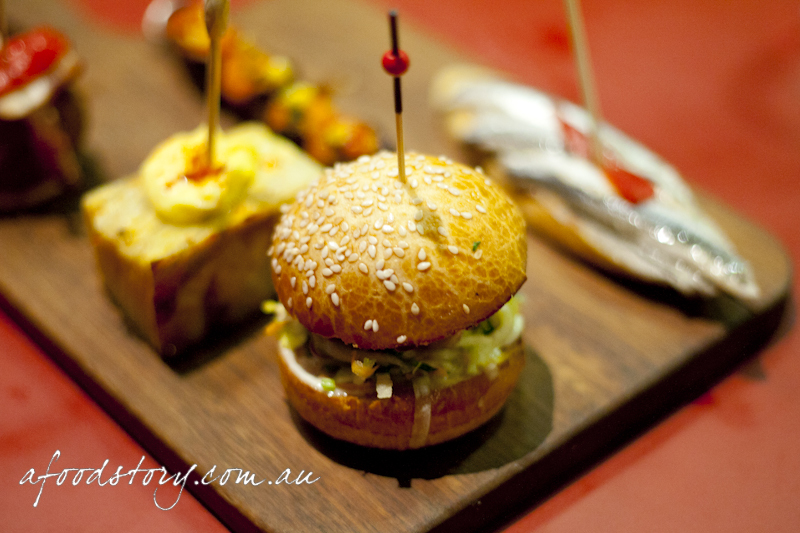 The slider was sensational, the pork was so sweet and tasty, quite a good texture, and the witlof slaw was mild enough to even surprise Lex. The grin on Mr O’s face said it all, best slider EVER! 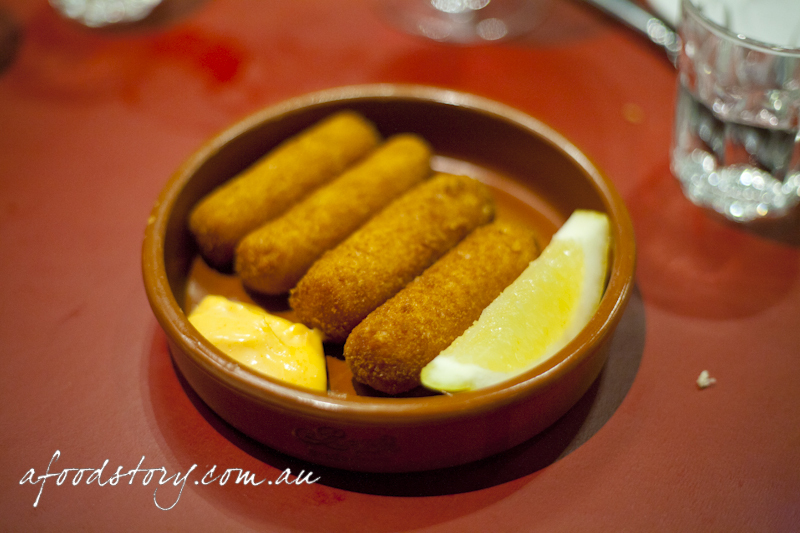 Jalapeno & smoked cheddar croquettes (Complimentary). Shortly after the main pintxos smashing was done Em arrived and we were able to guide her towards the best dishes. 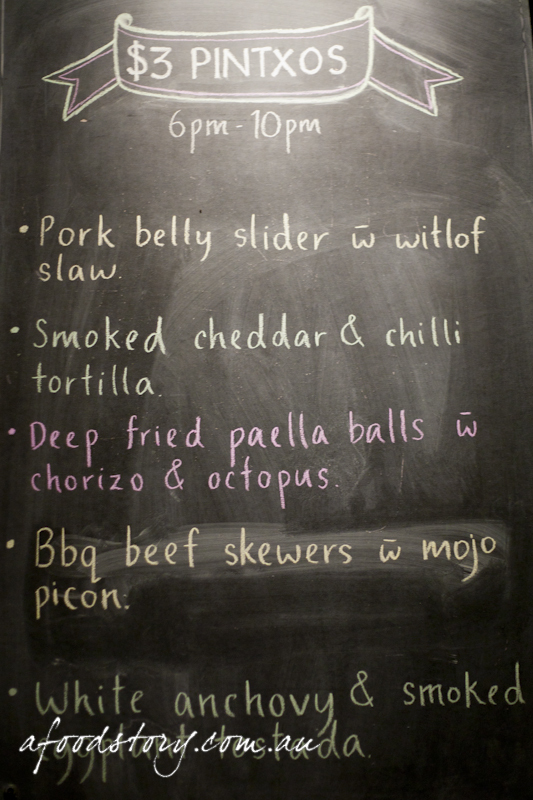 Em’s pintxos arrived along with a little treat from the kitchen – the jalepeno & smoked cheddar croquettes. The super crunchy shell was void of any oil and inside was the gooiest smoky cheesy centre that absolutely won me over with its jalapeno spice. 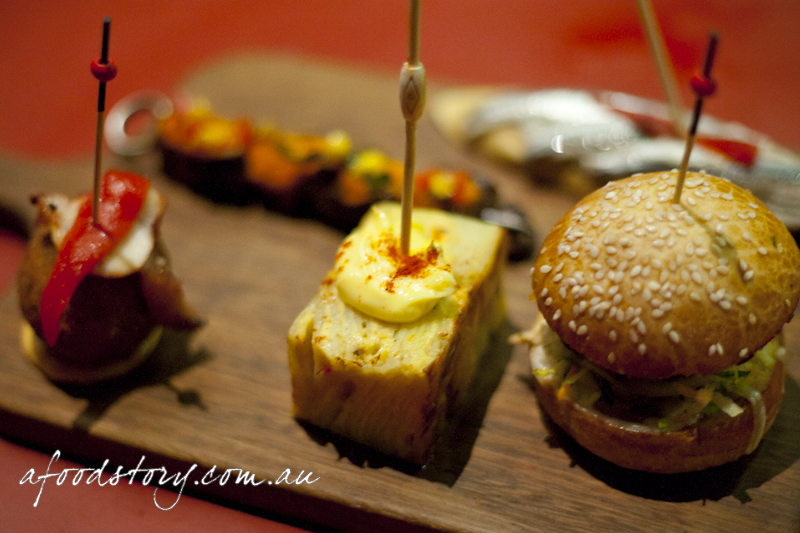 Although we all wanted another pork slider we decided to move away from the $3 pintxos menu and on to the tapas menu. 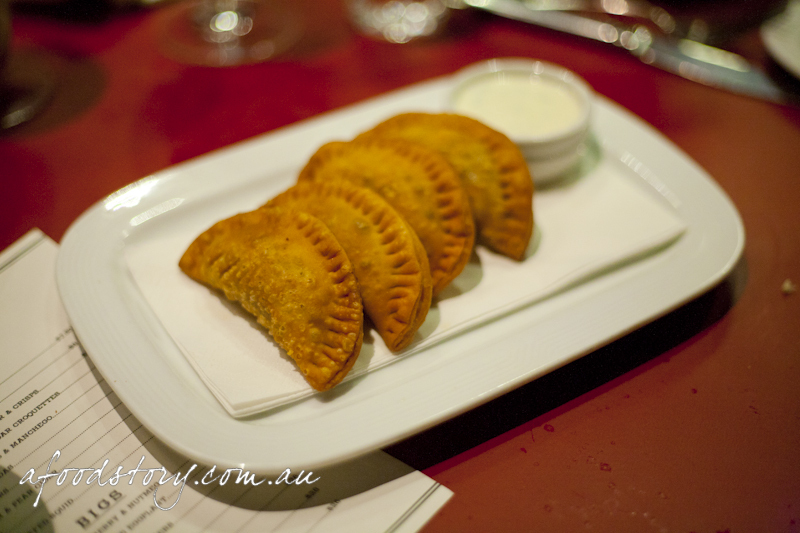 Same as last time and spurred on by the thumbs up from our waitress the bulls tail empanadas were next to be ordered. I just love, love, love these things. A super short pastry crust encasing some epically rich beef and accompanied by a refreshing cucumber and yoghurt dip. Kingfish pastrami on rye ($4.00). Tonight was the night for all things twitter so upon the guidance of MissPiggyEats we opted for the Kingfish pastrami on rye as out next pintxo. I was torn by the dish, I quite enjoyed the crazy levels of pickling that was going on, thin slices of gherkins and chewy bread but the ‘pastrami’d’ kingfish just didn’t work for me. I like kingfish cooked delicately but LOVE kingfish sashimi so the idea of turning it into pastrami seemed to be a miss for me. Chicken liver parfait & pear chutney ($4.00). 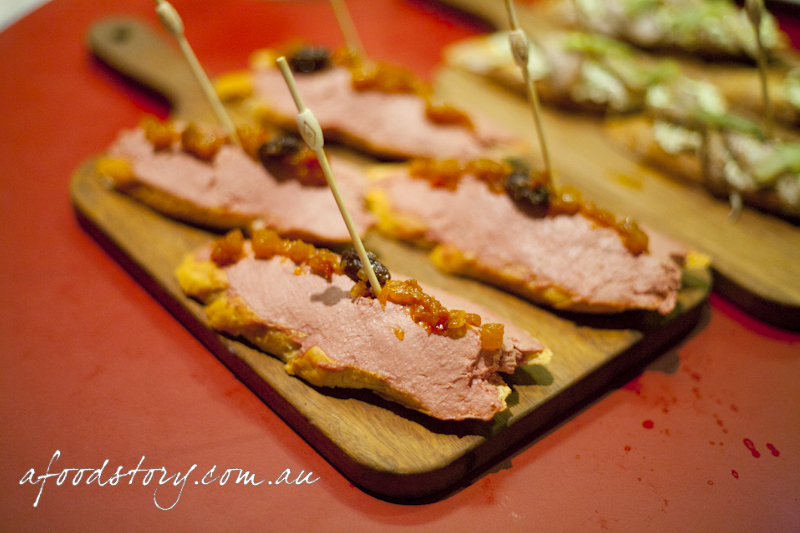 Once we let Mr O loose on the whole menu the chicken liver parfait was a given. That guy is literally addicted to the stuff, literally. When it arrived I was utterly amazed at the portion size, they were massive. 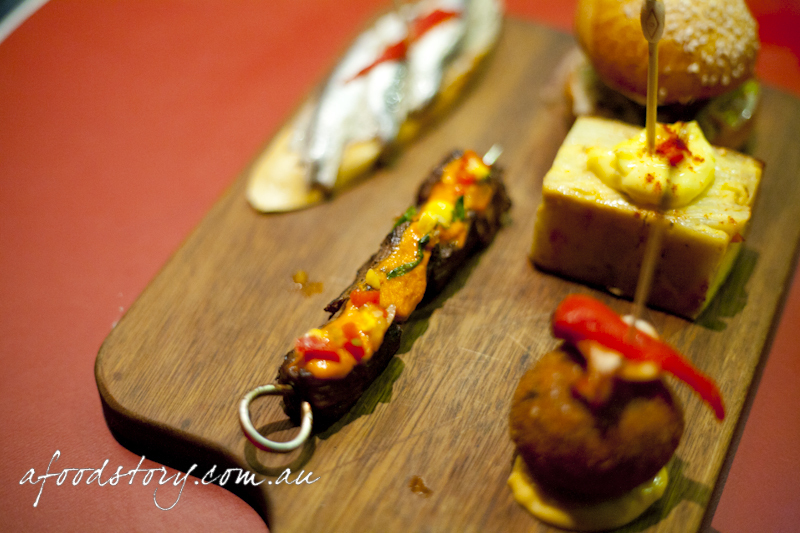 I cut mine in half and began to savour the rich pintxo. So full of flavour and quite possibly one of my favourite parfaits to date. The chutney was nice but did little to match the strong flavours presented. Before I began I knew defeat was in the air and I gifted my second half to the chicken liver parfait fiend, aka Mr O. 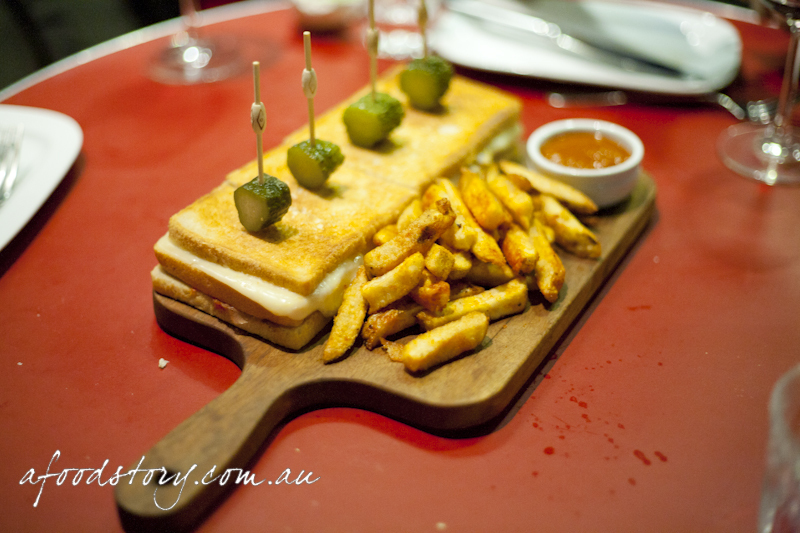 Media Noche – Triple pork, double dekcer, toasted cheese sandwich with bravas fries ($18.00). Things were getting a little out of control with the food ordering and our waitress again cautioned us over our eyes getting in the way of anything our stomachs could handle. With this guidance we decided not to order the Beef Cheeks in PX or the Morcilla Stuffed Squid just yet. The media noche (midnight meal in Spanish) was a pork feast in its own right, three types of pork (roast pork, serrano, sobrassada) layered between three pieces of bread and oozing with cheese, there wasn’t anything this sandwich could do wrong. Last visit I had thought the bravas fries accompanying the sandwich could have done with less of a chorizonaise and more of a spicy tomato salsa. Amazingly my wishes were fulfilled and we were treated to an amazing side of vibrantly fresh and spicy tomatoes that won me over completely. The fries were immensely good and complemented by the salsa perfectly. 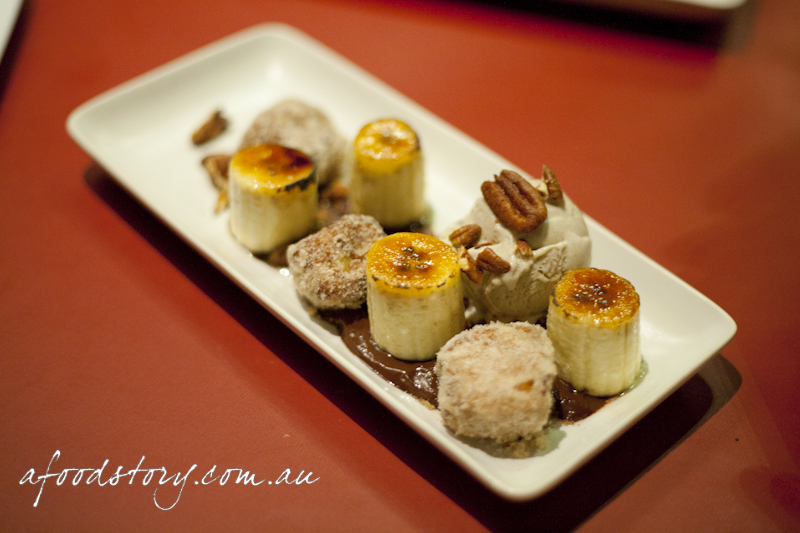 Fried milk banana split, pecans & chocolate ($12.00). A single photo on twitter of the current dessert on offer was all that we needed, we were sold on it before even leaving work. When it arrived it definitely lived up to expectations. The bananas were still so fresh and packed full of flavour with the added benefit of a perfectly caramelised top. The fried milk was so crazy good, the leche frita were gooey and and the cinnamon sugar was just perfect. Great combination of flavours and textures and one of my favourite desserts in a while. Ok so we got a little crazy with the ordering and were quite happy we were cut off at the pass, as after dessert and the last of our Malbec I was feeling rather full and quite content. The Carrington has become one of my favourite places to go after work, and somewhere I could see myself coming back to on quite a regular basis. 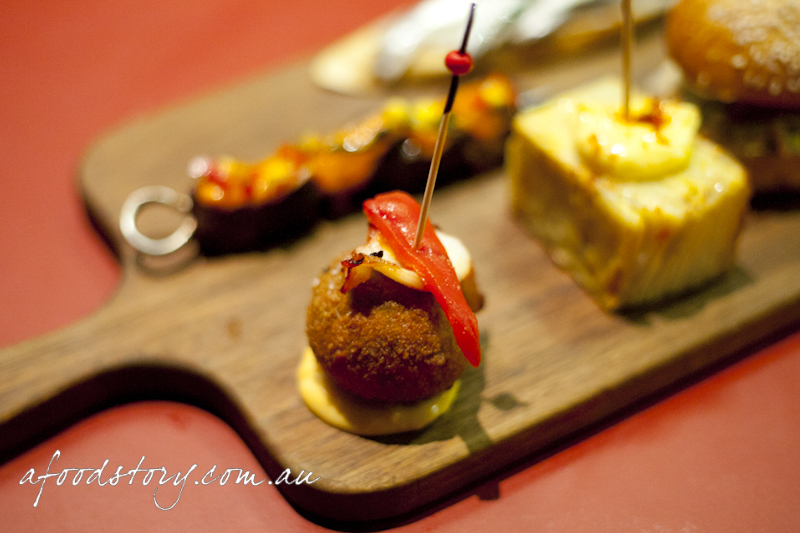 $3 Pintxos aside I dig the vibe of the place and LOVE the food, wine and service. 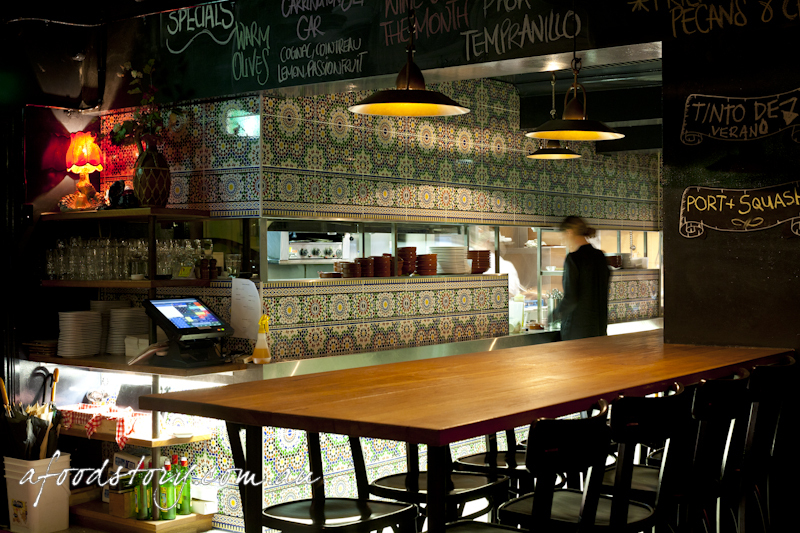 This could become our local quite easily and we live 40km away! 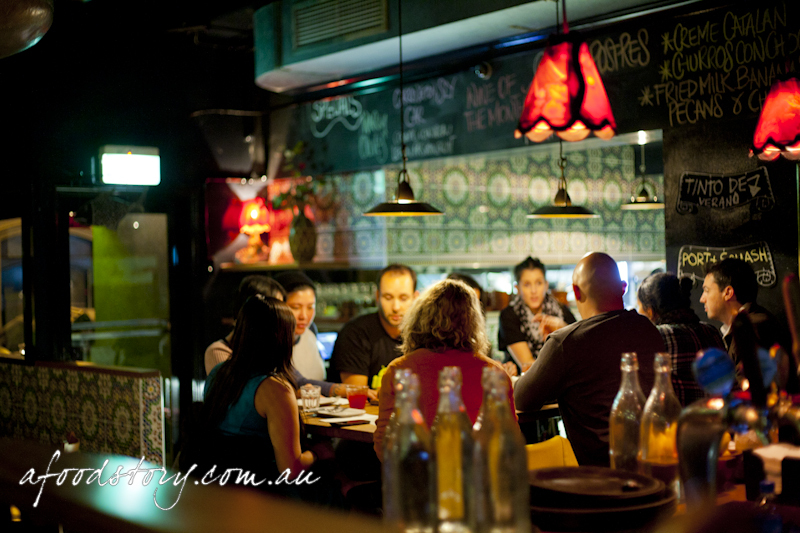 Next up has to be burger night and then most likely a toss-up between Jugs night or Sunday Roast. Either way I am sure we will be back quite soon.